The ancient name of the island was "Peparithos." The Peparinthos inhabited by the 15 ° BC by King Stafylos (brother of King Minos of Crete). famous in antiquity "Wine of Peparithos." In 1675 the main product of the island was the wine which was considered more tangible in the Aegean. In 1936 archaeological excavations were made and the tomb of the founder along with many coins era and a bronze double ax handle (the symbol of the Minoan civilization). The findings are preserved in the National Archaeological Museum of Athens. Renaming the island its current name, Skopelos, was during the Hellenistic period. 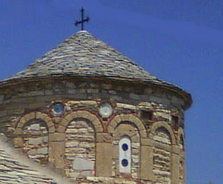 In the 4th century Bishop of Skopelos was St. Riginos, who is now patron saint of Skopelos. During the Frankish period, the island belonged to the family of Giza. enslaved by the Turks, the sovereignty of which he remained until 1830, when united with Greece, which had just opened. Asclepius was the god of medicine. On the coastal road of Skopelos after the hotel Mon Repos (100 m) there are ruins from his temple the ancient hospital. No ticket needed but there is time table. Castle was usefull to defend pirates and other enemies. It is very old. Some stones in the bases are giant. The old village is enclosed from the castle. Small houses with roof made of stone slabs narrow streets and many chapels (32) are a unique tour. Carved Tombs at the top of the mountain Chickpea". 20 minutes by car NW of Skopelos town. They called "Sedoukia". Follow the map of the island. Stop the car at the right point and go on foot for 2 Km at the top of the mountain. There are stone and painted signs across. Majestic view!